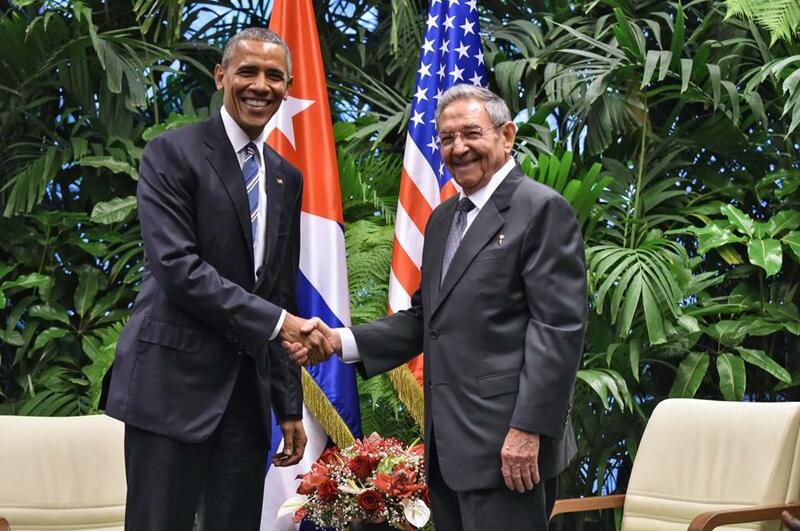 President Obama (left) shook hands with Cuban President Raul Castro during a meeting in Havana Monday. Immigration has been a big issue in the presidential campaign. So have income inequality and gun control. But starting now — and perhaps continuing at length — political experts expect the race to focus on terrorism and foreign policy. President Obama’s historic visit to Cuba, the highly scripted comments from Donald Trump to a Jewish lobby group, and the terrorist attacks in Brussels all occurring within days have set up a shift that could last until the general election, they say. This would be a dramatic change. Exit polls from the recent Illinois primary, for instance, found that the economy, income inequality, and government spending were more important factors to voters than terrorism. Yes, this has happened before. In the aftermath of the Paris shooting attacks, voters told pollsters for the first time that national security and terrorism displaced jobs and the economy as the biggest issues facing the country. Within a month, the conversation returned to more domestic issues. But the Brussels attack has occurred at the very moment when the front-runners for each party’s nomination are trying to pivot to the general election and show their foreign policy chops. Indeed, nonstop talk of terrorism in the news in the past week could be that last bit of help to Republican Trump and Democrat Hillary Clinton as they seek to clinch their nominations, according to Jennifer Merolla, a professor at the University of California at Riverside. Merolla is coauthor of “Democracy at Risk: How Terrorist Threats Affect the Public,” which found that when there is a terrorist attack, voters look to strong figures — in particular Republicans, incumbents, and men — and are more distrusting of others, particularly immigrants. David Paleologos, director of the Suffolk University Political Research Center, said he agreed that a campaign framed around terrorism could help Republicans win the White House. Still, some like Providence College political science professor Joe Cammarano are skeptical that Clinton, with her deep experience in foreign policy, would lose out to Trump, who just announced his foreign policy team this week. Cammarano, who has researched the shift in issue discussion in each of the past four presidential elections, believes the Brussels attacks will not change messaging in this campaign much beyond the next two weeks. “If, however, additional attacks occur that are seen as similar to Brussels elsewhere, terrorism will return to front and center, and will shift candidate messages for a longer period of time,” Cammarano said.